8 of 12 (67%) reviewers would recommend this product to a friend. The Tri-Tronics Pro 500 G3 EXP dog training collar allows you the ability to add up to 3 dogs to the unit by simply purchasing an additional EXP Receiver. The Tri-Tronics Pro 500 G3 EXP is a combination of both the Tritronics Pro 100 and the Tritronics Pro 200 Models. This collar has been designed for the serious trainer or those that want the ultimate that a training collar has to offer. The Pro 500 G3 collar has 18 levels of momentary and 18 levels of continuous stimulation and a tone only setting. The transmitter design is easy to use, even when operating multiple dogs. The toggle switch, on the face of the unit, is color coded to match the collars and allows for you to quickly and easily change from one dog to another. Stimulation levels can be set from 1 to 6 using the newly modified intensity dial on top of the transmitter. The tone/accessory button location is now on the faceplate of the transmitter. The Tritronics Pro 500 G3 EXP has a 1 mile range. The antenna on the transmitter is now a shorter fixed internal antenna which allows the range to be longer and more consistent. The new design of the antenna is more rugged with strengthens the durability of the transmitter. The Tri-Tronics Pro 500 G3 EXP training system is expandable to 3 dog models. Since the introduction of the G3, Tri-Tronics offers a collar and transmitter that is 30% smaller than the older versions. The receiver/collar is made of Lexan (which is the same material used in bullet proof windshields & glass) and built tough to withstand all the pressures of a hard charging dog and countless days in the field. All collars are 100% waterproof, rechargeable and come with a strap that fits dogs up to a 27 inch neck. The new Tri-Tronics G3 Receiver Charging Station charges your collar quicker and more efficiently so you can spend more time in the field. The new charging station rapidly charges your collar in 2 hours with a full charge. The NiMH batteries will last between 3 - 5 years and can never be overcharged. The NiMH batteries are now attached to the transmitter with screws; they are however still user replaceable, but a screwdriver is now required to change the battery. Please Note: There is an additional $130 added for every additional collar purchased. Increase the visibility of your Tri-Tronics G3 System by adding an optional light. The Tri-tronics Tracer Light is only $44.00 and is available in three colors: Red, White, and Blue. Tri-Tronics Warranty: The warranty covers all parts and labor and is transferable to a new owner. The warranty does not cover physical damage or abuse. The warranty is void if the remote trainer has been altered or if unauthorized service has been attempted. The warranty period begins with the initial purchase from Tri-Tronics or an authorized dealer. Proof of purchase may be required to obtain warranty service. Click here - Tri-tronics Pro 500 G3 EXP Owner's Manual. Summary:I am an owner of 3 dogs and I am still amateur at training them. I was in the market for a training collar that would fit my dogs’ training needs when I stumbled upon the Tri-Tronics Pro 500. I was excited to read that it can be used for up to 3 dogs. I just had to purchase additional receiver collars for me to be able to use it on all 3 of my dogs. I was new at dog training so it was very helpful that the Pro 500 was very easy to operate. I like that you can operate it using only a single hand. I was also very impressed on the performance of the battery. I would surely recommend this to other dog owners especially to those first time dog trainers. This product is packed with a lot of features and very easy to use. Summary:I’ve been hearing a lot of raves about the Pro 500 G3 and I’ve also read a lot of great reviews about this product. It wasn’t until I went to this dog show and was able to try the unit for the first time that I finally decided to get one of my own. When it was finally delivered at my house, we immediately went for a test run. It worked perfectly. I had no problems with following the directions on how to operate the unit. My dog had so much fun that he gets pretty excited each time he sees me with the collar. He knows that he’s in for another fun activity. It was also an advantage that the product is waterproof. It performed well even in very wet conditions such is in a swimming pool. If you buy this product, you and your dog’s satisfaction is guaranteed. Summary:If you want to have both the benefits of momentary and continuous stimulation then the Pro 500 is a good product to tryout. I was very happy with the 18 levels of both continuous and momentary stimulation. It gave me a lot of room to test which would best fit my dog. I only have one dog now but I’m planning to buy another one. And since this product is expandable up to 3 dogs, then that won’t be a problem. I’m sure I will have tons of fun playing with my dogs. Summary:The Tri-Tronics Pro 500 offers two options for sending the correction to your dog – the continuous stimulation and the momentary stimulation. I really love that they are offering this option with this product. I was a bit hesitant with using an electronic collar on my dog at first so I was relieved to know that the Pro 500 offers the momentary stimulation which for me is a lot milder than the continuous correction. Although I tried the collar on my hand at first and I found out that even the continuous stimulation wasn’t that bad. It was just a mild “shock” even at relatively higher settings. But still, I opted to use the momentary stimulation which was very much enough for my dog. Summary:I own a 1 year old Doberman who is really too much for me to handle especially when we go out of our yard. I’m very happy that Tri-Tronics Pro 500 definitely gets her full attention. And I only had to use the lowest setting of momentary stimulation. Although it’s great that it has a lot of control levels. It may become useful in the future if I get other dogs. I previously bought a dog collar and it was a major dud. The batteries often run out. It was exasperating! I’m so happy with the Pro 500. It’s one of my best buys for my dog. The Garmin PRO 550 with proven Tri-Tronics® technology is for the professional dog trainer or avid hunter in mind. This unit has a 1 mile range and gives you easy access to 21 levels of momentary and continuous stimulation. Universal E-Collar Replacement Strap replaces damaged straps on several of the most popular collars on the market. These SunGlow collars are ultra sturdy. Tri-Tronics Dual Charger - G2, G2 EXP, and G3 Models - used in conjunction with the G2 charging cradles. This power supply has two leads which may be used with the transmitter or receiver charging cradles. Tri-Tronics G2, G2 EXP and G3 Receiver Charging Cradle can be used as a replacement charging station or for those trainers who want an extra charger in multiple locations. Compatible also to the newer Sport/Combo G3 Collars. This is the replacement transmitter ONLY. 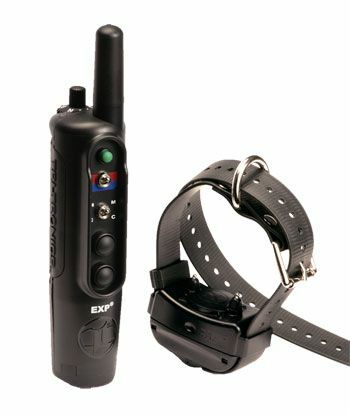 This does NOT include the Tri-Tronics Pro 500 G3 EXP Collar or Receiver. This replacement transmitter is to replace a lost transmitter and cannot be used as a second transmitter to your current unit. Tri-Tronics Transmitter Battery is available for the G3 Field and Pro Series units. This battery fits only the G2, G2 EXP, G3 and ViceBreaker collar receivers. It may be charged separately. Tri-Tronics Extra G3 Receiver Collar is 33% more compact. 100% Waterproof. Rugged and durable Lexan housing. The Tri-Tronics G2 and G3 Field Charger is ideal for the sportsman who is always on the go or in the field. This dual lead field charger makes it easy to recharge your Tri-Tronics G2 and G3 series electronic collar while in your vehicle. Gundogs Online Field and Pro G3 and G3 EXP Holster fits the Field Pro Series. This holster will ONLY fit G3 and G3 EXP Models.